Prevent multiple instances of the same user handle. Several users are signing on to our forum using their first name as their Username. In addition they're not using avatars. The result is that they can't be accurately tagged (mentioned) in a comment. 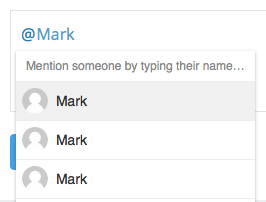 For example, we have several users with the username "Mark" with no avatar. Trying to tag one results in a string of "Mark" options with no way to discern which is which. Ideally when a user signs up they should get a message the username is in use, preventing them from using it, requiring them to use a different username. Hi Craig, thanks for your feedback! I can see how unique usernames would be helpful in this case. We will track this as an enhancement. Also, one thing to keep in mind: in the mentions menu the users already participating in the discussion are always listed at the top. Thanks for that. It would be embarrassing to mention the wrong person. Is there a difference between the sequencing (in this case between the 2nd and 3rd person with the same username)? There are times when I want to mention someone else to bring them into a discussion. Hi CraigS , we have released an update today that includes this feature! Check out the announcement for more details. Thanks for suggesting this idea! Forumbee Support Thanks! this is great help in tracking customer posts for us.